Ever wonder why even those who never had glasses have a hard time seeing things up close when they reach middle age? With age, your eye’s lens is likely to become more rigid, which makes it harder to focus on close objects. We call this presbyopia. And it’s universal. In an effort to avoid eyestrain, people with undiagnosed presbyopia may hold printed text at arm’s length to be able to focus properly. Additionally, performing other tasks at close range, for example, sewing or writing, can also result in headaches, eyestrain or fatigue in people with this condition. In order to treat presbyopia, you have a few options available, which take your eyewear preferences into account. An oft-used solution is reading glasses, though these are generally most useful for those who wear contacts or for people who don’t already wear glasses for problems with distance vision. Even though these are easy to find at pharmacies or drugstores, it’s advised not to buy them until you’ve seen the results of a comprehensive eye examination. The reason for this is that reading glasses may be handy for quick periods of reading but they can eventually cause eyestrain when used for long stretches of time. A more beneficial alternative to regular reading glasses are custom made ones. They can also rectify astigmatism, comfortably accommodate prescriptions which are not necessarily the same in both eyes, and on top of that, the optic centers of every lens can be made to fit the person who wears them. The reading distance is another detail that can be designed to meet your exact needs. And if you already own glasses for near sightedness, and would rather just wear one pair of glasses at a time, think about bifocal or multi-focal corrective lenses, or the popular progressive addition lenses (PALs). These are glasses that have separate points of focus, and the lower part of the lens contains a prescription to give you the ability to focus on things right in front of you. 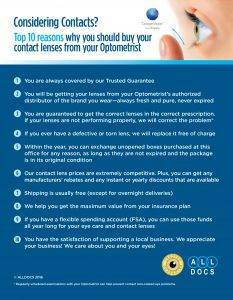 If you wear contact lenses, meet with us to discuss multifocal contact lenses. There’s also a treatment approach known as monovision, where each eye is fitted with a different kind of lens; one for distance vision and one to correct close vision. However, you’ll need to periodically adjust your prescriptions, because eyes change with age. Presbyopia could be a problem for older individuals even after refractive surgery, so it is it’s worthwhile to take the time to find out about all the options before making decisions about your vision care. It’s best to speak to your optometrist for an unbiased perspective. We can give you the tools to help you deal with presbyopia and your changing vision in a way that’s both beneficial and accessible.